I found this oil highly effective against insomnia, a few days back i was facing problem of insomnia for which I used this and got nice results. Testimonial I found this oil highly effective against insomnia, a few days back i was facing problem of insomnia for which I used this and got nice results. This essential oil is extracted from organic ginger, which is a creeping perennial on a thick tuberous rhizome. The plant of ginger has narrow, lanceolate to linear-lanceolate leaves that die off each year. The white or yellow flowers grow directly from the root and terminate in a long, curved spike. 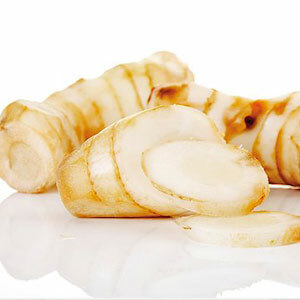 Ginger grows best in tropical and sub tropical regions having good rainfall and hot and humid summers. The oil is Indian Organic Certified. It blends well with all citrus and spicy oils such as bergamot, frankincense, neroli, rose, sandalwood and ylang-ylang. It has various chemical constituents such as a-pinene, camphene, b-pinene, 1,8-cineole, linalool, borneol, y-terpineol, nerol, neral, geraniol, geranial, geranyl acetate, b-bisabolene and zingiberene. It also contains 7-10 % crude fibre, 4.28% oleoresin and 1.83% of volatile oil ; whereas improved ginger contains 4-5% crude fibre, 4-8% oleoresin and 1 -1.3% volatile oil. Organic ginger acts as a digestive aid and ease in indigestion, stomach pain and nausea and for stopping diarrhea caused by poor digestion. Owing to its spicy and peppery aroma, ginger oil is often mixed with other essential oils to prepare various mixtures for different ailments. 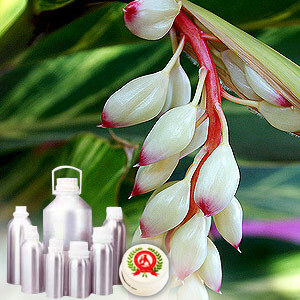 The powder organic ginger is used as a food flavoring agent and is great in various types of Indian and Chinese dishes. It finds application in pharmaceutical preparations and is beneficial for cardiovascular health and increases the tone and peristalsis of the intestine. It is effective against fever, dropsy, asthma and jaundice.